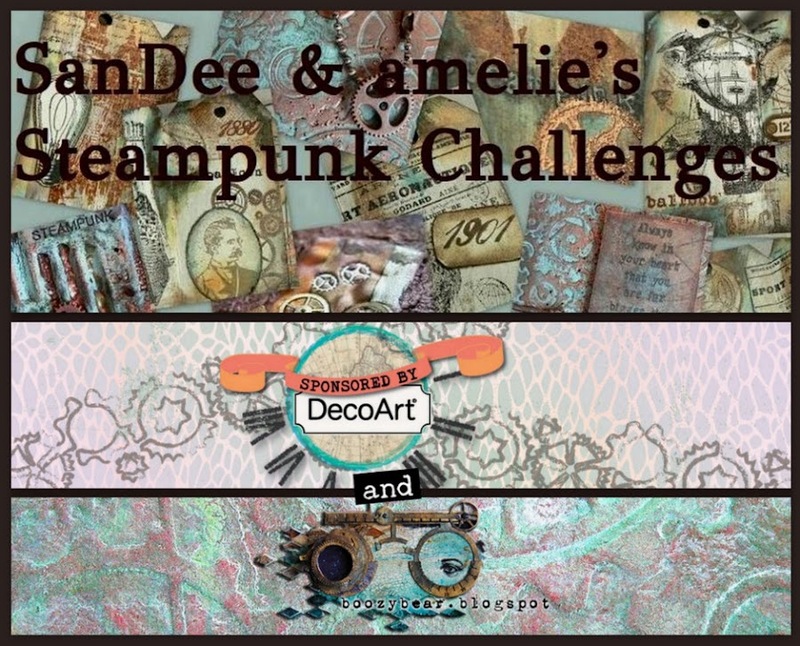 Hi, servus and welcome to our announcing the Top5 and prize winners from the September challenge, dear steampunk and industrial style friends! 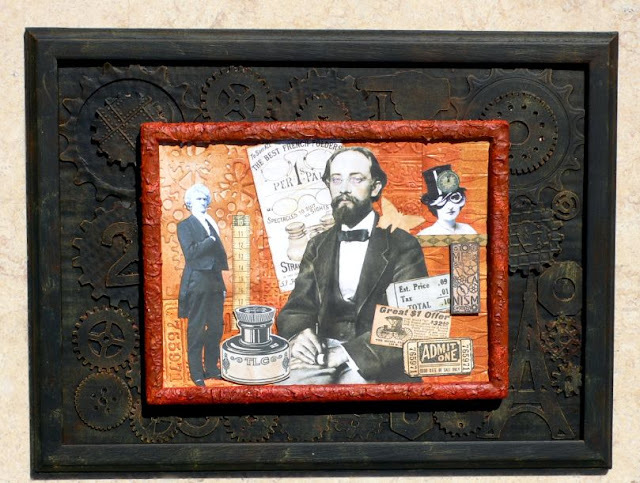 the other - a surprise package of awesomely inspiring steampunk chipboard pieces - by awesomely talented Glenda aka boozybear. The winners get drawn randomly from all proper entries. So make sure you've checked our few challenge rules before you enter our challenge for the first time! 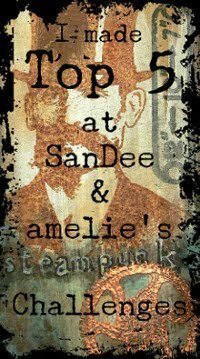 And without any further ado .... our September Top5! Applause, applause, applause!!!!! Steampunk hat blew us away completely! 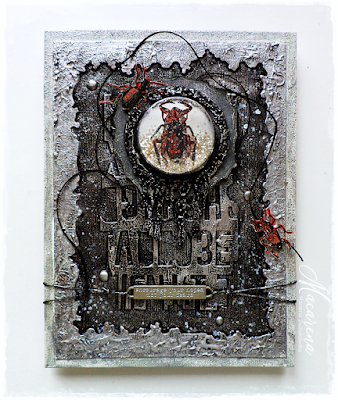 Hi, servus and welcome back to the start of our October challenge, dear steampunk and industrial style mixed media, stamping and crafting friends! 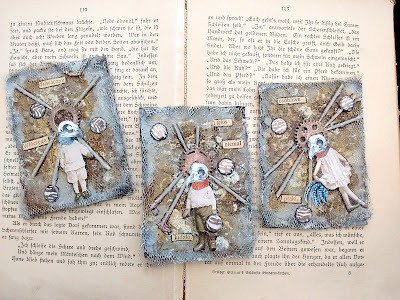 but as Halloween is fast approaching we of course also welcome projects that are a mix of both - steampunk/industrial elements and Halloween fun! 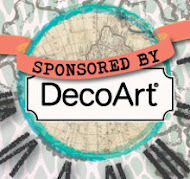 This way you don't have to interrupt any Halloween swing you're currently in but are still able to play along with us (and get eligible for one of our two prizes being given away to randomly drawn players by our generous sponsors DecoArt media and boozybear). The challenge is open until the end of the month. Prize winners and Top5 will be announced on the 15th of the following month. If you haven't already checked out our few and simple to follow challenge rules, we would like to ask you to do so before entering our challenge - it would be a shame if your wonderful makes would have to be excluded from Top 5 votes or prize draws! 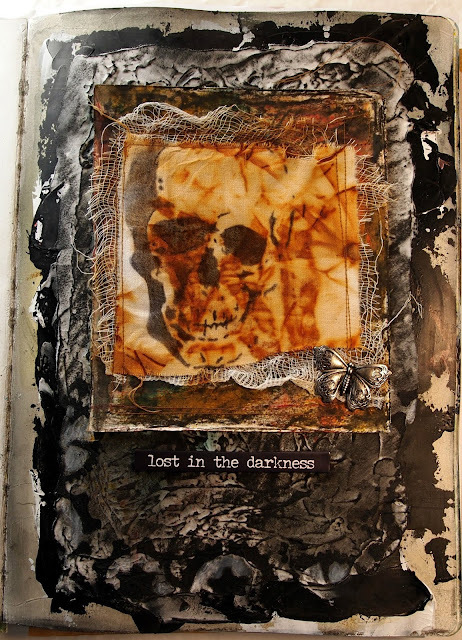 headed over to the darker side this month, inspired by the legends of the Celcitc goddess Morrigu. 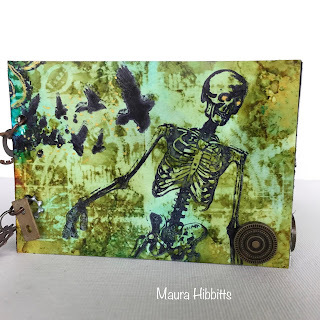 She created four ATCs using alcohol inks, then connected them into a folding panel. 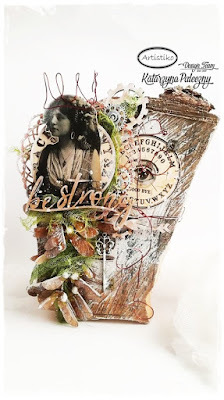 has once more created a beautifully layered mixed media panel in her unique style. the right time for a tombstone in a bewitched place!" 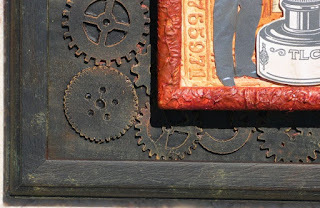 steampunk themed bits 'n bobs. 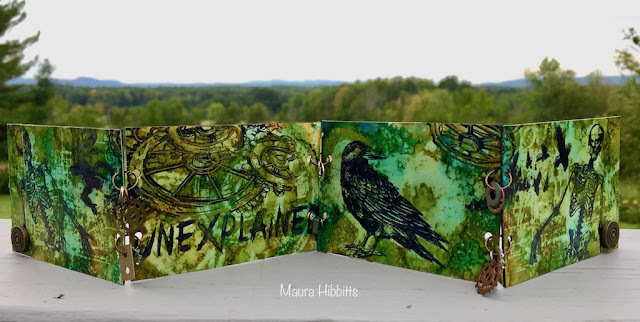 You just gotta love this mini steampunk album! As usual you will find more images and info on the projects by visiting the design team's blogs. Please, leave them a little love there if you can spare a second or two. You will make them very happy by doing so! Thank you! 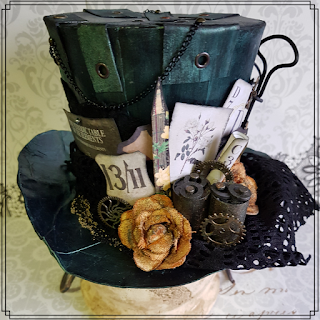 So get your thinking hats on, rummage your boxes with those long hoarded treasures, browse your favourite steampunk and Halloween themed dies, get out your favourite colours for this time of the year....do whatever makes you happy at your craft desks and share the results with us by entering our challenge. We love being inspired by all your fantastic makes and your imagination! 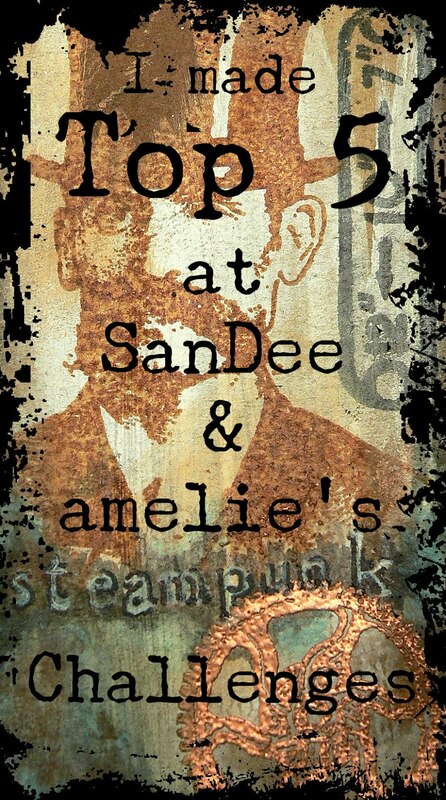 Don't forget to come back here on the 15th to find out who made it into our September Top5 and who won the prizes from our two generous sponsors!